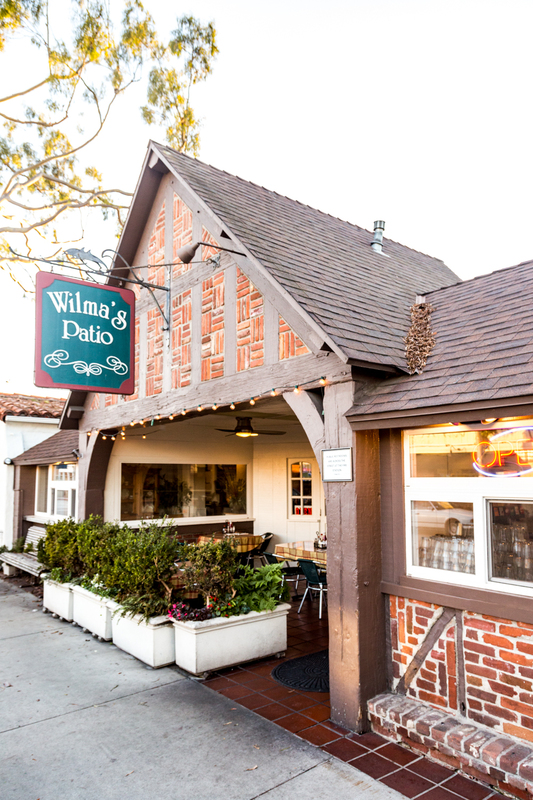 Wilma’s Patio – The Best Casual Neighborhood Eats in Newport Beach. Come for the food, stay for the family. 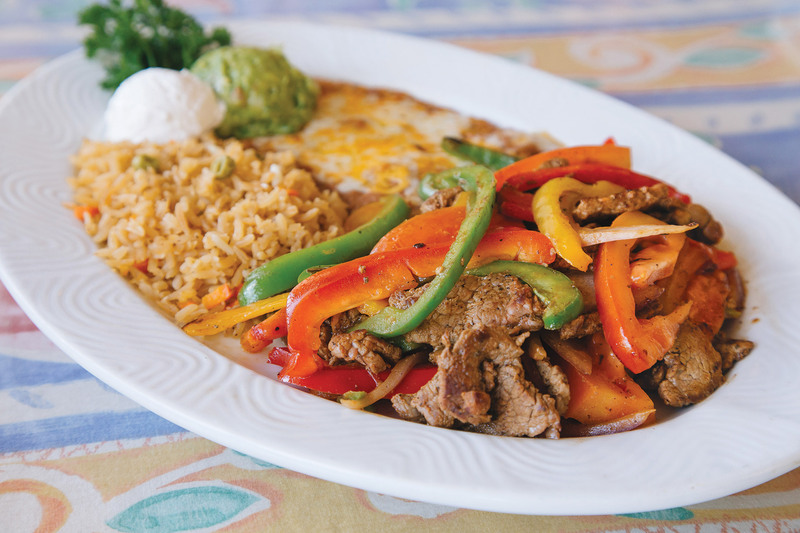 At Wilma’s Patio, our focus is simple. It’s on your experience while you’re here. We invite you to relax and enjoy some home-style cooking and hospitality with your family and friends. 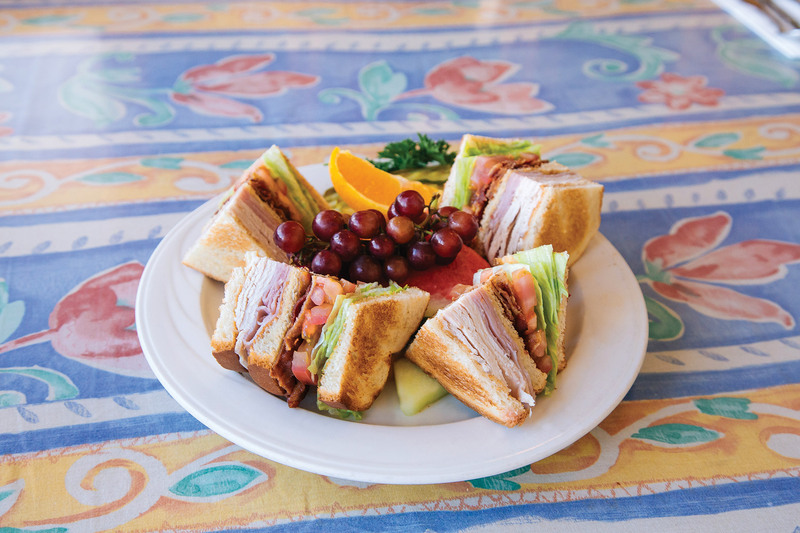 Come for the food and good service, enjoy your stay, and we’ll see you back next time! Our goal is to create a warm atmosphere that invites, delights and comforts. 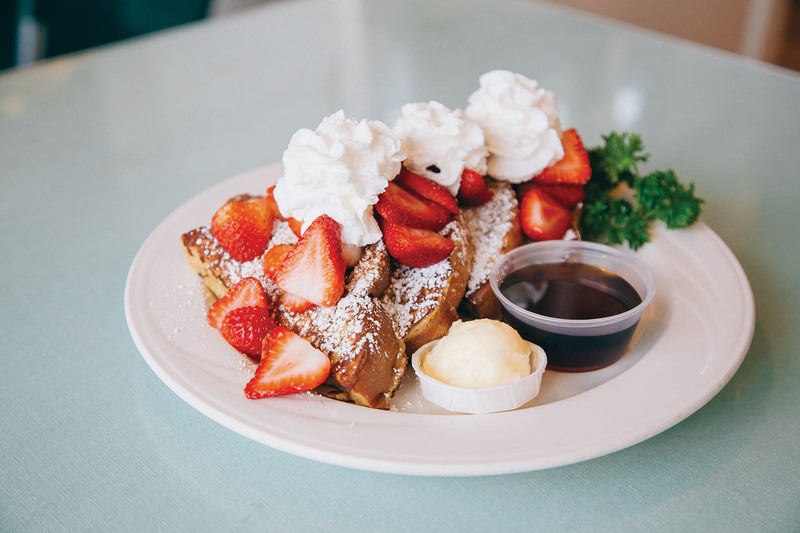 Located on Balboa Island’s Marine Ave, just steps from the beach, Wilma’s Patio is a casual neighborhood eatery with some of the best home-cooked meals in Newport Beach. 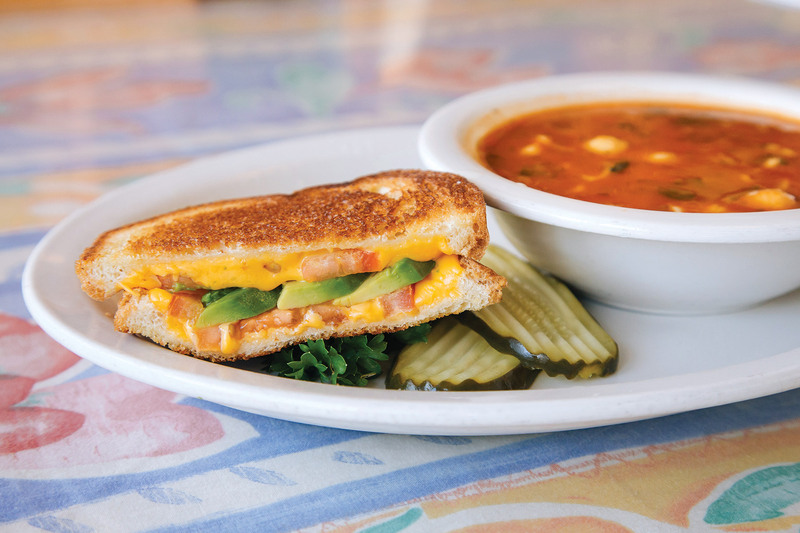 Wilma’s is a family restaurant built in a casual atmosphere. The Drewry family owns and manages the restaurant, the cooks come from two families and are cousins and most important, the family of customers. Our regulars come for their “fix” ordering the same item and sitting in the same cozy spot. 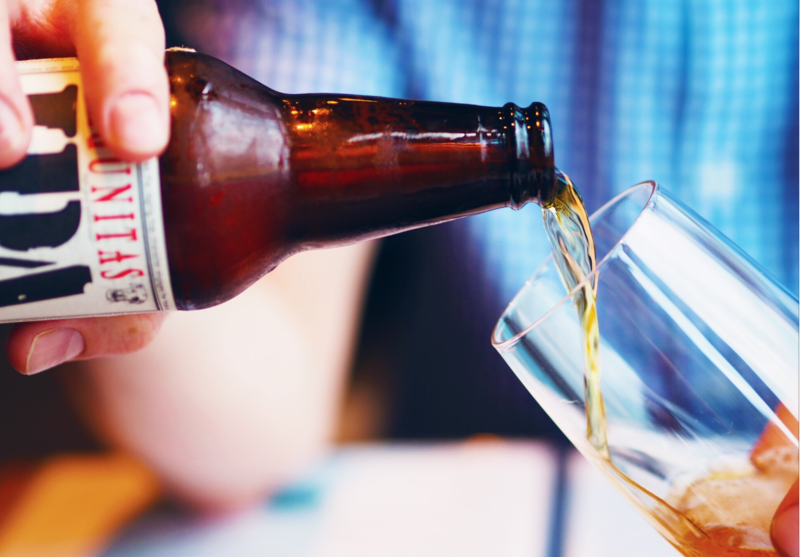 Come on in and find a new favorite. Wilma’s is fortunate and proud to have Tomas as our head chef since 1991. 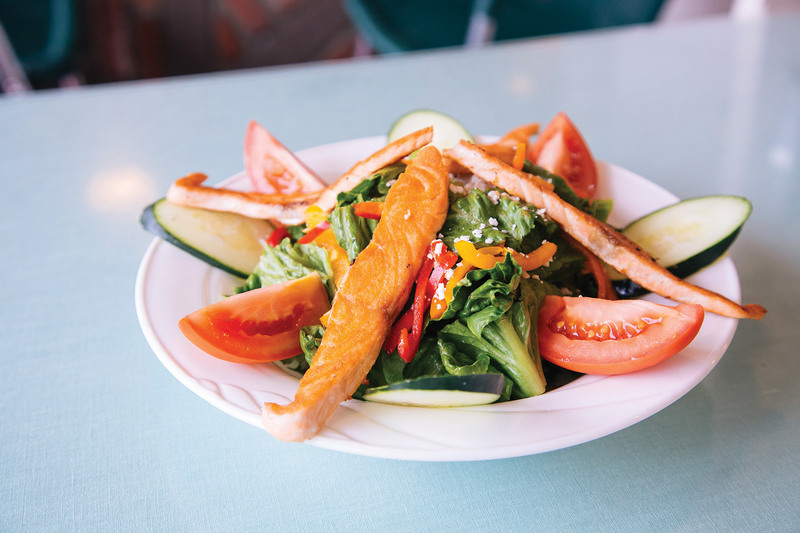 His style of preparing wholesome meals from fresh, healthy ingredients has been a perfect fit for Wilma’s Patio. Chef Tomas has been cooking since childhood, where his family encouraged him to learn to cook as a part of his upbringing. 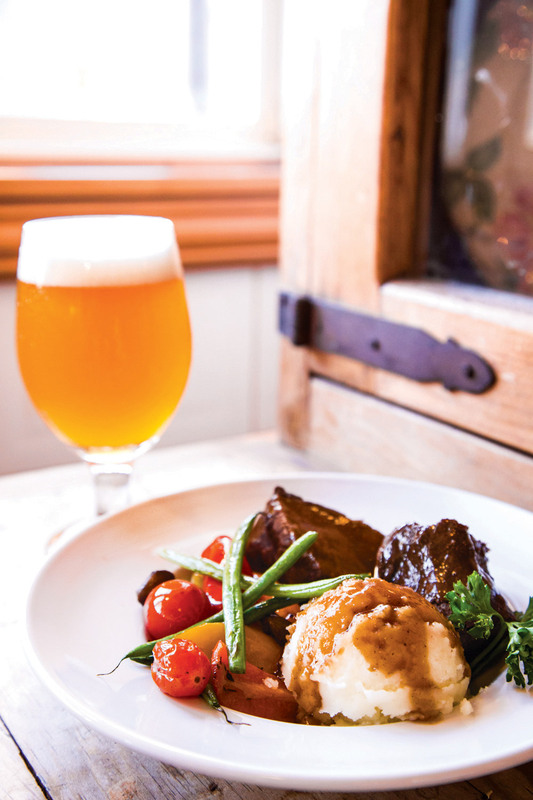 Tomas puts a fresh spin on classic dishes, and creates fresh new flavors unique to Wilma’s, all with his passion for fresh and wholesome food, flavored with healthy ingredients, and made with care. This is my favorite place to get a good breakfast in Newport Beach. I sit at the bar, they smile and say hello, like they know me and are happy to see me, yet I've only been here 5-6 times. Wilma's is my go-to whenever in California. The food is always amazing with tons of choices, but what makes Wilma's special is how we're treated whenever we go. Doesn't matter if we go years between visits, we're treated like family and welcomed like the most important customers in the world. The restaurant was pretty packed when we arrived we got seated very fast. Food and service was great... Try any of their Eggs Benedict meals. They're all delicious! Served with real crab meat. Comes with two poached eggs served on toasted English muffin, Hollandaise sauce, and hash browns or fresh fruit. Scrambled eggs wrapped in flour tortillas, topped with enchilada sauce and melted jack and cheddar cheese. Served with hash browns, guacamole, sour cream, and salsa on the side. Corned beef hash served with two large eggs cooked any style. 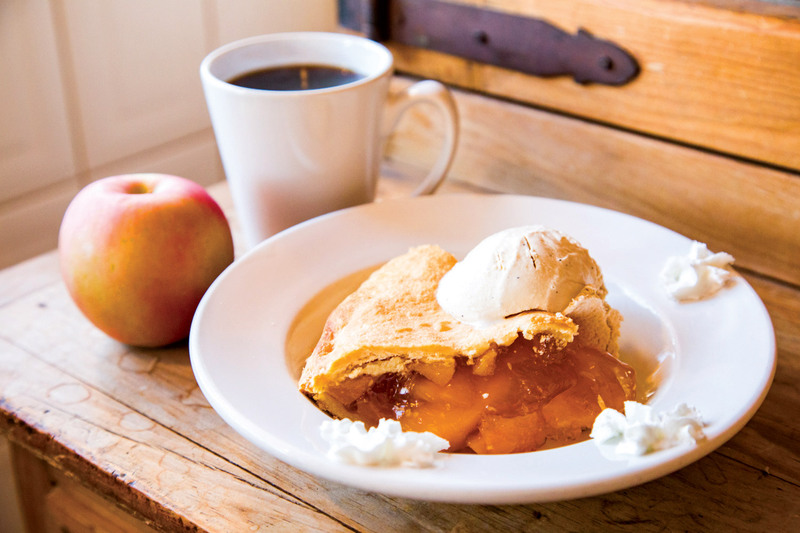 Served with hash browns or fruit and choice of toast or cornbread. Thick sliced egg bread, dusted with powdered sugar and cinnamon. All of our griddled goods come served with a side of syrup and whipped butter. Add fresh strawberries and whipped cream +4.00. Add fresh chopped pecans +1.50. 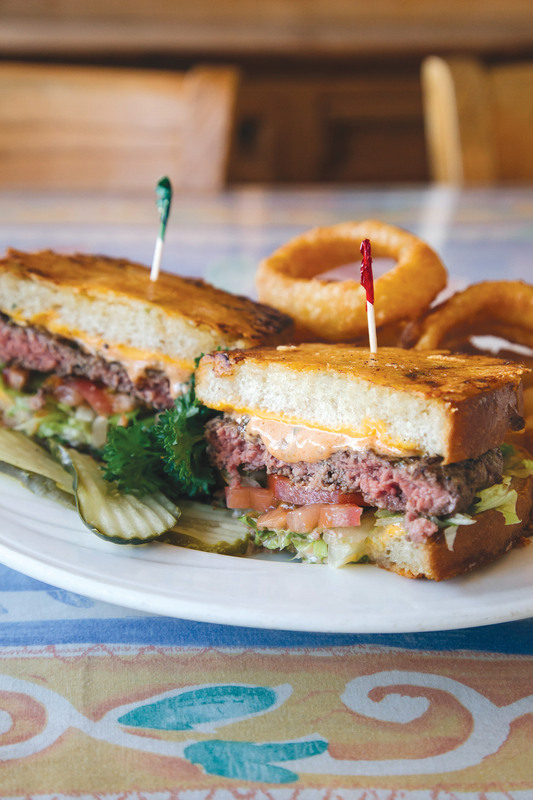 Ground chuck, short rib, and brisket blended into a juicy 7-ounce flame-broiled patty and cooked to order. On Parmesan grilled sourdough, with American cheese, shredded lettuce, tomato, thousand island dressing. Mixed salad greens, diced chicken breast, feta cheese, green onions, black olives, tomatoes, and red cabbage, tossed with a combination of ranch and Italian dressing. Topped with roasted almonds and chow mein noodles. Chicken, steak, or veggies, grilled with bell peppers, onion, and tomato. Served with tortillas, guacamole, sour cream, and fresh salsa, as well as vegan refried beans, and Mexican style rice. Ham, turkey, thick sliced bacon, fresh tomato, iceberg lettuce, mayo, stacked on three slices of white toast, cut into fourths. 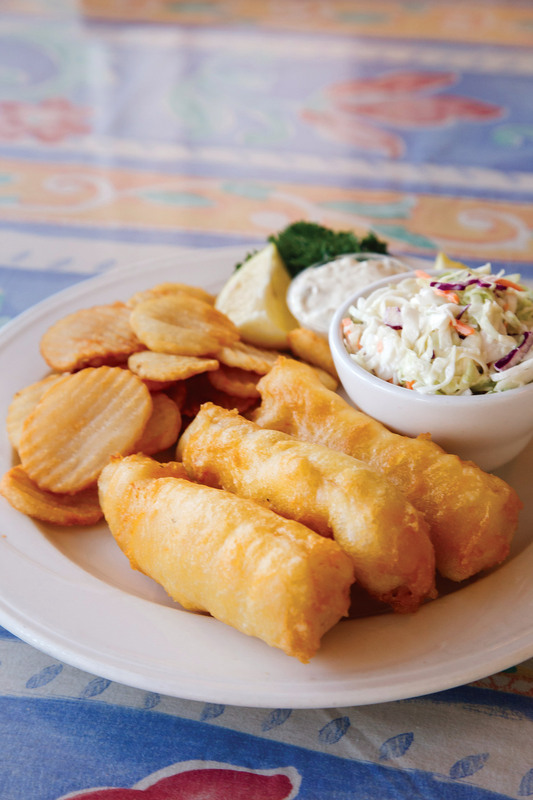 served with cottage fries, coleslaw, or fresh fruit. Substitute onion rings for fries +2.50. Battered chicken breast, fried golden outside, moist inside, with mashed potatoes and gravy. Served after 5:00 pm, with flame grilled fresh veggies, a fresh roll, and butter. 10 oz. prime rib eye steak, lightly seasoned, flame-grilled to order and served with a baked potato. Served after 5:00 pm, with flame grilled fresh veggies, a fresh roll, and butter. A flame-grilled 6 oz. 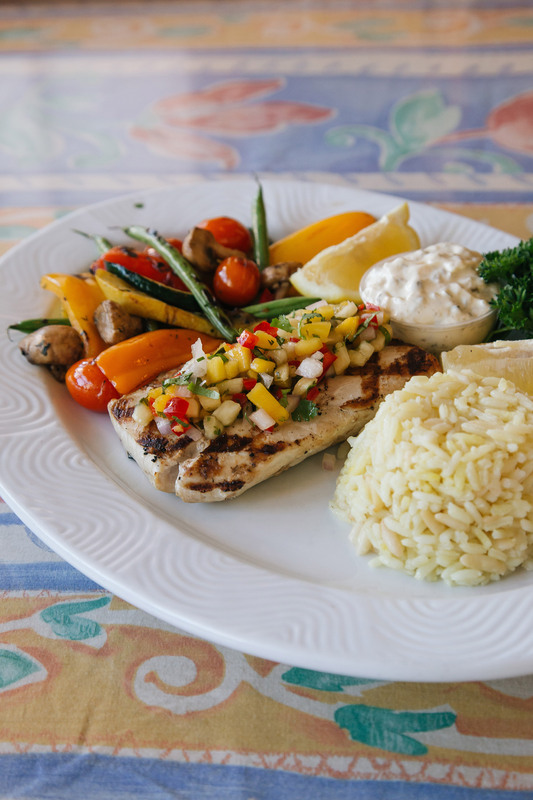 mahi-mahi filet, topped with sweet mango salsa and served with rice pilaf. Blackened with spicy Cajun seasoning +2.00. Served after 5:00 pm, with flame grilled fresh veggies, a fresh roll, and butter. Thinly sliced filet mignon in rich a sour cream sauce, with onion and mushrooms. Served over egg noodles. Served with a dinner salad and garlic toast.